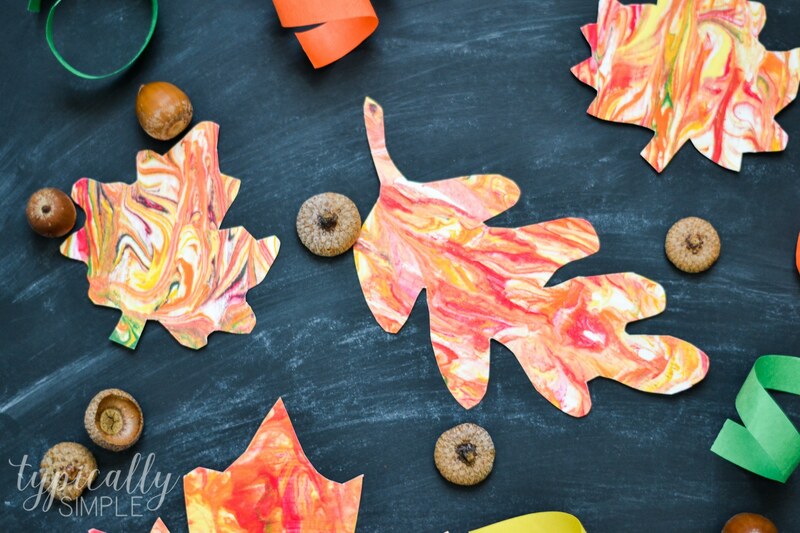 Grab a few supplies and make these unique marbled paper fall leaves with the kids! A fun craft project for fall! We finally have some cooler weather around here and it’s actually starting to feel like fall! One thing I love about fall is when all the trees start to change colors. So I thought it would be cute to make a craft project with paper leaves and fun, fall colors! This marbled paper craft is such a fun one to make with the kids. It’s a little bit messy, but that’s half the fun in making marbled paper! 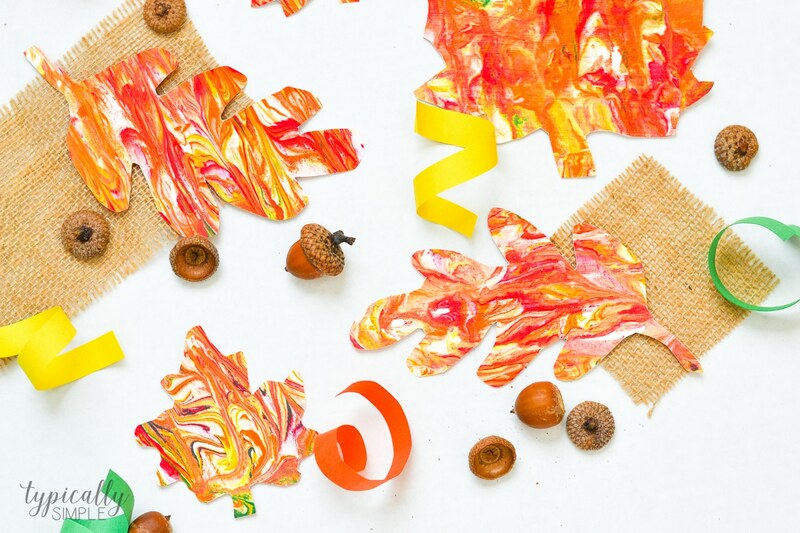 I love that the kids can pick out their favorite fall colors to use in this craft…plus it’s a great project for the younger kids to practice scissor skills. 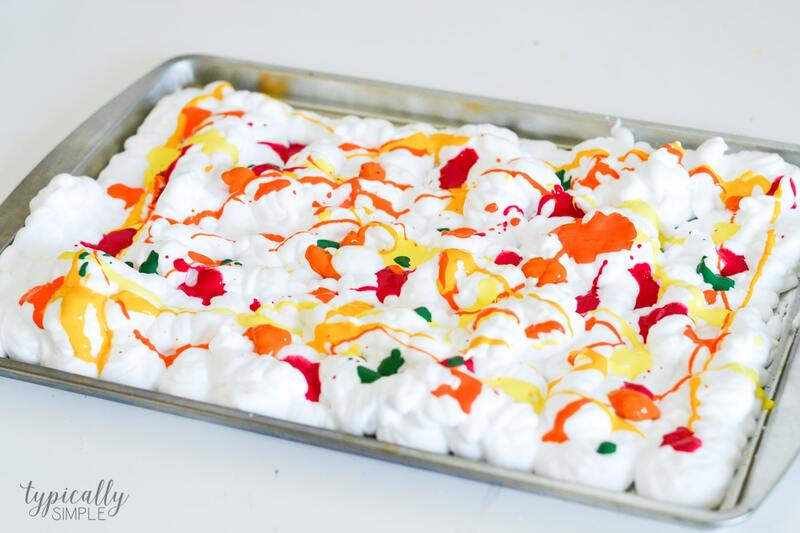 Spray some shaving cream on the tray and spread it out. Add a few good squirts of paint all over the top of the shaving cream. 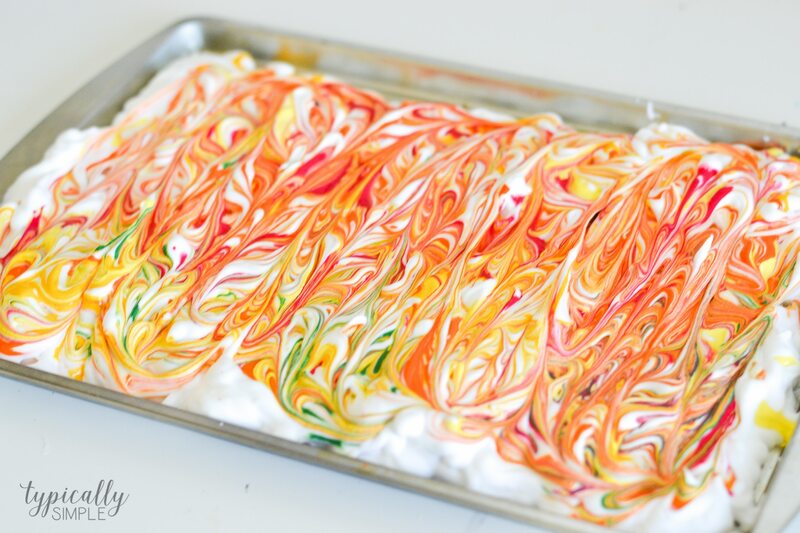 Using the pointy end of a paint brush, drag the paint through the shaving cream to start creating the marbled looks. Go up and down, then back and forth. Take a piece of paper and lay it on top of the paint & shaving cream, pushing it down just a bit. Peel it up and put off to the side for a few minutes. Using some sort of scraping tool, remove all of the shaving cream – this is where the newspapers & paper towels come in handy! Let the paint dry for a bit, then cut leaf shapes using a template. This project was first shared on Somewhat Simple. I just love how bright the colors turn out using this marbled paper technique! We like to make little banners out of projects like this to hang in our playroom. It would also be super cute to hang on a mantel or even create a wreath out of the leaves! Looking for more projects ideas? Be sure to check out these fun fall activities & crafts!